All paper drills from the Dürselen range are easy to operate and flexible regarding various applications. For processing of large volumes and for in-line paper-drilling we offer automated paper drilling systems in different performance classes and for different applications. 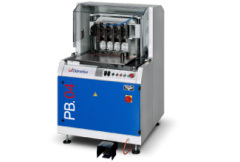 We create special machines for any application from the field of paper drilling - cutting - finishing. As far as possible we use components from our standard models and combine them with individual modules and interfaces. For all standard hole patterns, complex ring binder patterns and multiple holes for mechanical / wire binding we offer the models. Whether in copy shops, in-house print shops or offices - when making documents like instruction matrerial or user manuals: Dürselen office drilling machines.